Juliana Redding was found dead in her apartment. She had moved from Arizona to pursue acting and modeling. (CNN) -- A woman was formally charged Monday with the 2008 killing of an aspiring actress and model, California authorities said. Kelly Soo Park, 44, was charged with murder and her bail was set at $1 million, the Los Angeles County district attorney's office said in a statement. A second suspect, Ronnie Wayne Case, 34, who had been arrested in connection with the case, was released, the Santa Monica police department told CNN. In an earlier media statement, the Santa Monica police said both Case and Park had been "charged with murder with special circumstances and conspiracy." There was no elaboration on what led to Case's release. The victim, Juliana Redding, 21, had moved from Arizona to Los Angeles to pursue the Hollywood dream. 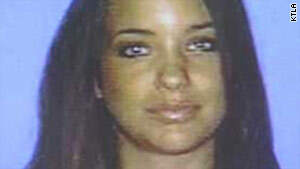 Her body was found in her apartment on March 16, 2008, police said. "Park allegedly entered Redding's Santa Monica apartment on March 15, 2008, and physically assaulted her, causing her death," the prosecutor's office alleged in a statement Monday. Sgt. Jay Trisler of the Santa Monica police told CNN the case is not closed. "This is still an ongoing investigation," Trisler said. "We're following different leads. Even if there may be other arrests, it's still a pending investigation for us." Redding had a role in a 2005 independent film and had also taken courses at an area college. She also worked part-time at a tapas bar in Venice. Anyone with information on the homicide or has had any relationship with the suspects is asked to call the police at 310-458-8488.